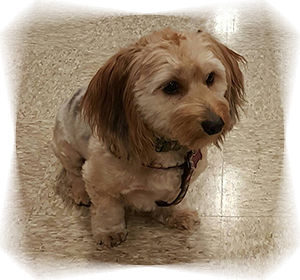 Emma, formerly Darby, is working on becoming a therapy dog! 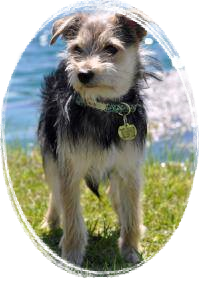 We love these wonderful updates from our adopters! 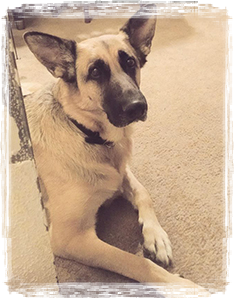 Just over a year ago, SMART Rescue placed one of our beautiful german shepards, Sadie, with a retired Airborne Ranger who was recovering from injuries. 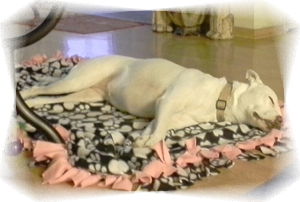 A SMART Rescue Board Member covered the cost of the adoption and Sadie got a great home. "Once again, thank you so much. She has made such a powerful and positive impact on my life"
Just wanted to let you know I am really happy at my new home! My new mom let's me sit in her lap all the time and sleep with her ,my dad and my new big brother..he's the best, he let's me curl up next to him! Oh and my new mom got me a doggy car seat all my own..I love it..but still getting used to riding in the car..love.playing.outside with my cousins..they are leaving this weekend but lots of fun! I just love everyone...but most.of all they love me! ADOPTED!!! Chloe now resides in Austin with her brother, Locker. Lucky dog!!! Austin has been good to Smart Rescue. 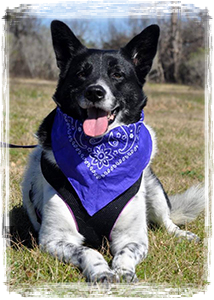 Three dogs and two cats have been adopted to Austin area residents in the past year. Taz, Poppy, Reiley, PJ and Chloe. Thank you, Austin peeps!!! Sage and Abby were adopted together today!!! 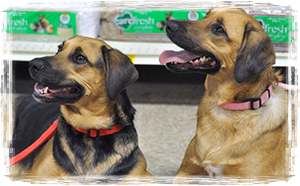 They were originally adopted from Smart as puppies in 2012. Earlier this year when their family was transferred out of country, Sage and Abby were returned to their original foster. 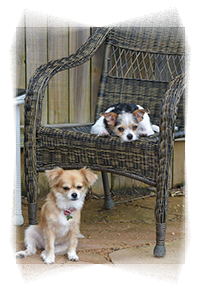 They are extremely bonded and we are ecstatic that they were adopted together. 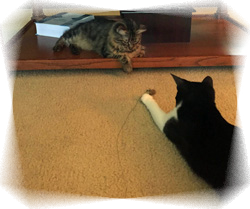 When Kim Silva retired from teaching at the American School for the Deaf, she decided to start teaching sign language to her cats. "Guess I missed the kiddies so I began teaching the kitties!" Silva says. It all started after setting sights on a deaf cat named Bambi. 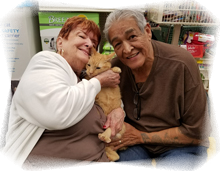 In 2009, after losing another beloved pet, Silva and her husband, John -- who are both deaf -- were ready for a new feline companion. "[We] fell in love with Bambi on Petfinder," Silva says. 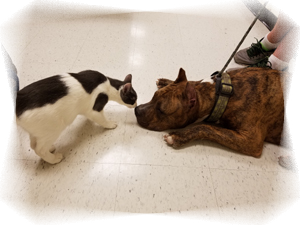 Silva's previous teaching experience was pretty much limited to humans, but she was optimistic that American Sign Language would help Bambi live most fully -- and that the cat would be a perfectly good student. "Since my daughters learned signs from infancy, I had ideas how to introduce sign," she says. Bambi was at A Smart Rescue in Texas, though, and it would take a while before she could be brought to Connecticut, where Silva lives. In the meantime, she figured, she might as well get started with the cats she already had, even though both of them could hear. A lot of deaf dogs have learned ASL. Groups like the ASPCA say training cats in general is possible (always using positive reinforcement, of course). Still, Silva says even "some deaf people have questioned if cats could learn sign." "Bobcat immediately understood," she says. 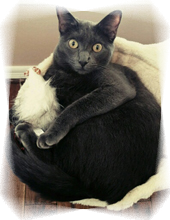 "My other cat, Bear, was very old and was not interested." Bobcat learned one sign after another "until he learned the new vocabulary," Silva says. "Bobcat was a sponge for sign language! He showed off. He was fabulous." Bambi picked up the signs even more easily, since, Silva explains, she had "peer reinforcement and copied Bobcat." Thomasina, who then joined the family in 2013, after Bear died, learned even faster. The cats have a delightfully expansive vocabulary. Among the words they now know are: "come," "more," "sit," "stay," "shake," "high five," "sleep," "circle," "shrimp,' "play," "canned food," "finish" and "dance" (though sometimes they don't feel like doing that one). They also know "off," which Silva must spell out, letter by letter. A lot of the commands are carried out in the video at the beginning of the story. 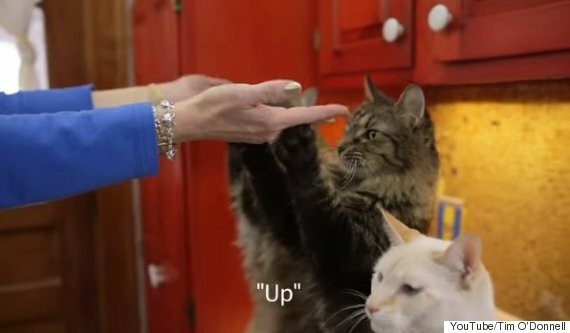 Silva hopes the clip, made by her son-in-law Tim O'Donnell, will inspire others to adopt deaf cats of their own -- and teach them sign language, too. 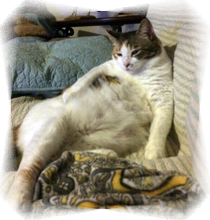 "Cats become much more interactive with people because they want to communicate," Silva says. "Bobcat was a 'pillow that ate' before he learned sign. He interacted with other cats, but ignored people. 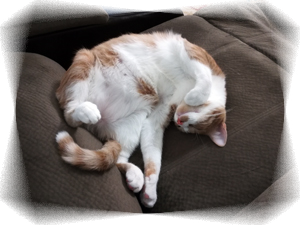 After he learned sign at age 7 years, he became the extroverted show cat! My cats will also do tricks with other people who sign with them." While the talented cats respond to Silva's commands, they don't actually sign themselves -- at least not a whole lot. "Bambi likes attention and likes to play ball. She stretches up to tap my hands signing 'play' for me to get her ball," says Silva. Still, she remains hopeful her communicative felines will one day acquire more of this rather wonderful skill. "I would like for my cats to be able to sign to me and ask for food," she says. "I have seen this online in other signing cat videos, but was not able to teach Bobcat. I will try again with Bambi and Thomasina." Jerry was adopted in June. Jerry came to Smart with his brother, young, barely 8 wks old and already terrified of people. Jerry is doing great in his home, still scared of strange men, but he has come a long way! Tator, formerly known as Frazier, is real glad his mom is home from vacation. He loves seeing his former foster mom, who doggy sits him, but he misses his momma. Rescued from the streets of Houston, Tator is loving his new life! 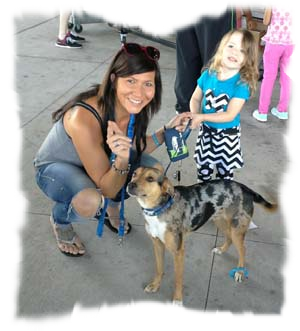 Finn was adopted by a wonderful family at The Woodlands Harley Davidson adoption event. 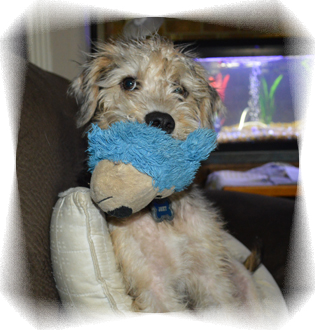 Joey was adopted by a wonderful family that just loves him dearly. 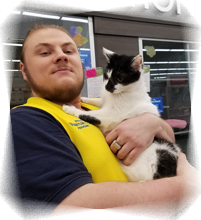 Brik's adopters went to PetSmart to buy a cat tree for their current cat when they spotted him and fell in love. 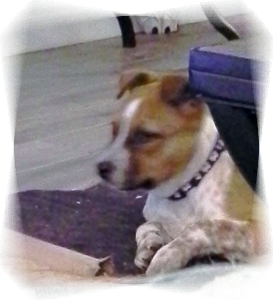 He is assimilating well and enjoying the company of the cat and 2 older dogs in the house. 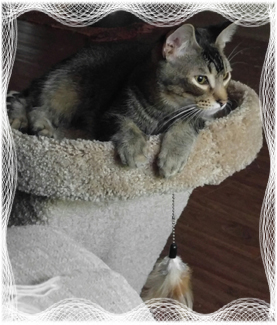 Brik seems to be enjoying the new cat tree. 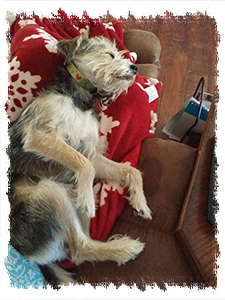 Prior to being adopted, Dottie was introduced to her potential canine family member. It was a match made in heaven and now she's in a wonderful, loving home. Care Bare (formally Barrie) was adopted in September. As you can see...Care Bare settled into her new home very quickly. She took a nap as soon as she arrived "home". 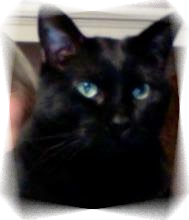 Remy (now Raven) was adopted in 2008. He's doing great and will be 9 yrs old this coming March. He is very, very smart so, he can be quite a challenge. Here are some picture of him being mischievous as usual. His mom says that she should have named him ALVIN like that chipmunk since he's always getting into trouble. Prior special needs was adopted by her foster mom who couldn't part with her after taking care of her during her recovery. Update on a Spring 2016 kitten adoption. This is from her mom "She's over a year old now and is doing great...she's very spoiled and talkative and weighs 11 pounds! She loves manis/pedis and stealing stuffed animals from the kid's rooms. We sure love this Big girl!" Calamity is a big girl with a big attitude. She was adopted by a mom that says she has an attitude to compete with Calamity! Angel is having a ball in her new home...she has her own room! As you can see, Santa was good to her. Shaba is a special girl. She was rescued during the Hurricane Harvey floods after her 89 year old owner tragically perished. She was in need of a lot of love and happily she found it! 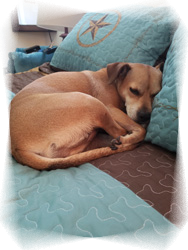 Scooby, a sweet 4 year old boy that was rescued from the shelter along with his new owner. Two happy guys! Zorro and his new mom. Zorro loves his new home and chewing on the new ball his mom got him! Catalina and her new mom are all smiles as it was love at first sight! July, 2018 Bonnie - from her new mom: She’s super playful and loves to chase the broom when I’m sweeping. She is also the best cuddle buddy. She is so loving and goes to all of us for some love and attention. She also gets along really well with out boxer duke. We are so i live with her and she is just the sweetest addition to our family. 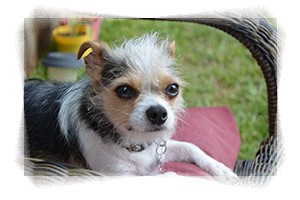 Frieda has settled into her new home and is loving the pampering her new mom is giving her. She instantly became part of the family! Mocha (formerly Lenny) has officially become part of the family. According to his mom "He's best buds with their black and white kitten. We love how he trills when petted. He often curls up to sleep with us at night. He's a dear and sweet, companionable cat. We're so glad that he is ours and we are his! Thanks for rescuing our dear kitty!" He has settled in at his new forever home. 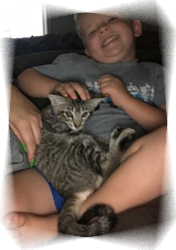 He fit in so well at his foster home after being pulled from a shelter just as his time was up, his foster family decided they needed to give him a forever home. He is a total love and is already very spoiled. 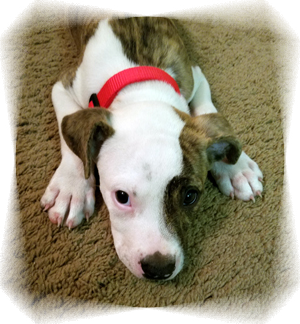 He was found running the streets at 8 weeks old and after a lot of care and TLC grew was ready for adoption. Today he's sleeping in bed with his family and not on the streets.